SPECIAL NOTE for REACTOR users: The MJ pump is the perfect pump for use with reactors on reef aquariums. 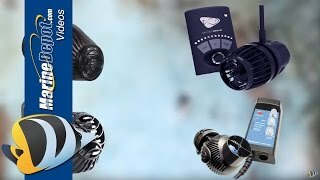 One thing to understand is that reef aquariums have high levels of calcium, in fact at almost saturation levels, and areas with slightly higher temperatures can have active and dramatic precipitation of calcium on parts, ie impellers and impeller shafts. In as little as 4-5 months, calcium can build up enough to stop an MJ pump. Calcium build up is NOT covered by the warranty, but is easily kept in check with routine maintenance. Every 2-3 months, take out the MJ and remove the impeller, soak in distilled vinegar for 15-20 mins, then scrub parts with an old toothbrush and work the impeller up and down shaft to break up and mineral deposits. Rinse with fresh water and re-install impeller and MJ into system. 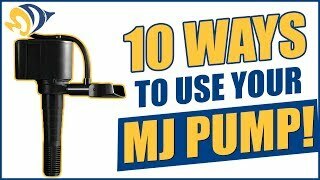 This simple maintenance will keep your MJ running like new for years. This pump is pretty nice, I was lucky to get it with a used tank I bought. At first after owning a maxi jet witch was load I was having second thoughts about it. After it turned on, I couldn't even hear it running... If the water wasn't moving I wouldn't even know it was there. Stopped working within 6 months. Suction cups love to fall off. I got this pump to work with a reactor. At first it worked great. Then after 5 months it quit producing as much flow, and now at the 6 month mark the reactor just trickles. Great little pump for running an DIY algae reactor. So quiet that you have to look very carefully into the reactor or look at the end of the outflow tubing just to check to see if it is working. It's small size means it takes up minimal space in the sump. Well worth the cost. this lil guy didn't come to joke around he disperses water like a speed boat on a mission!! He's as quiet like a thief in the night!! What more can one ask for?? I hereby apply two 👍👍's up! !